I recently saw a patient for chronic right shoulder pain and tightness. She is a personal trainer who owns her own boutique fitness center. Her injury happened last summer after punching a heavy bag. After throwing a jab, she forgot to retract and the bag came back hitting her outstretched arm. Since then, she has pain with push-ups, and most overhead motions, particular with external rotation. Mobility screening found LRF and general shoulder abduction and ER to be DP - with moderate loss of ER. However, upon changing the active and passive pattern from shoulder abduction then external rotation in supine to full ER with the arm in adduction against her trunk, then abduction, she obtained full threat free ROM. 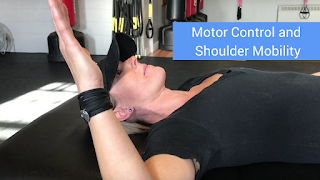 Check out the video below, I thought it was a great example of motor control and neurotags associated with certain movements. Treatment included some light subscapularis inhibition with isometric elevation, repeated shoulder extension for resets, and Suspension Trainer Wall Angels for HEP.